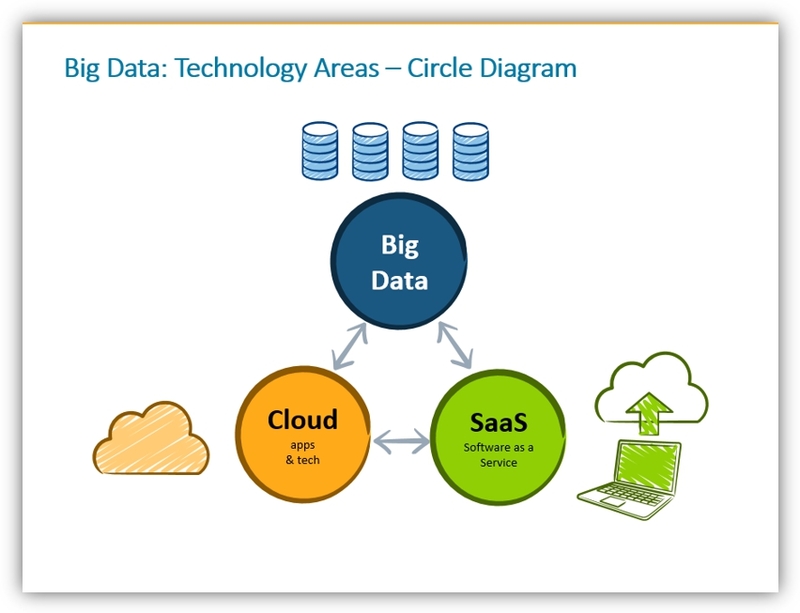 Are you about to present Big Data or other modern cloud-based IT technologies? You know your presentation will probably contain various abstract and complex topics that are not so easy to explain using only verbal form. 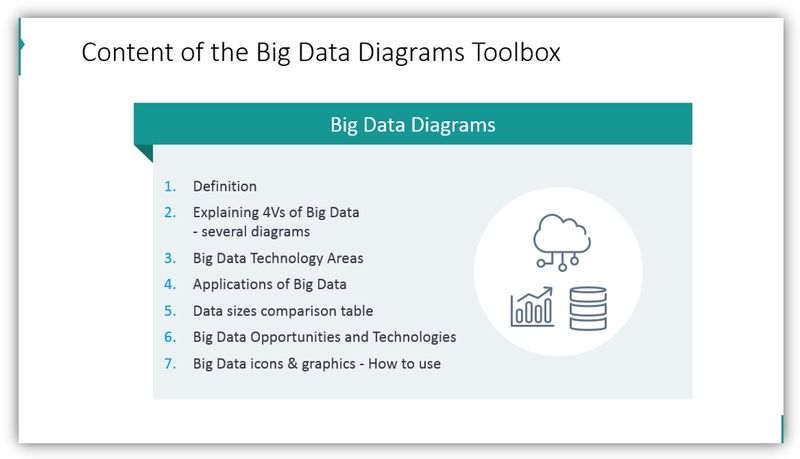 Hence it’s a good idea to use some visual thinking to represent how those Big Data systems work, what are the essential structures and artifacts. Creating graphical representation is a way that helps you make your presentation eye-catching and easy to understand. It can have a form of a handwritten sketch or simple diagram. Use visualizations to explain the basic computer science concepts and data structures. 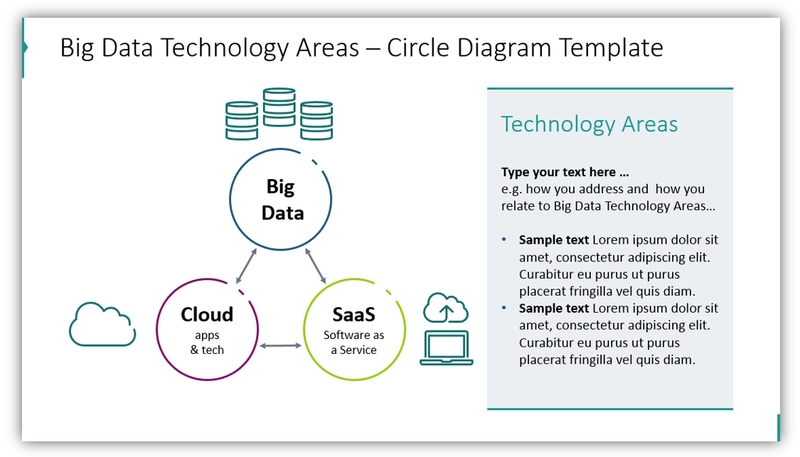 Show big data dependencies by a flowchart instead of a set of text bullet-points. To help you start, here I present several Big Data infographics examples for your inspiration. 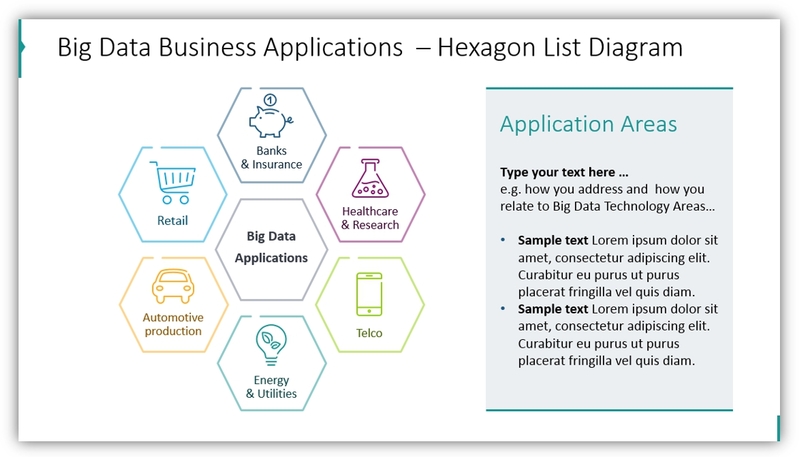 Note: All example slides below are accessible in Big Data Diagrams PPT library (see details by clicking the pictures). Let’s explore several visualization examples. Every good presentation starts with introducing the topic and agenda. 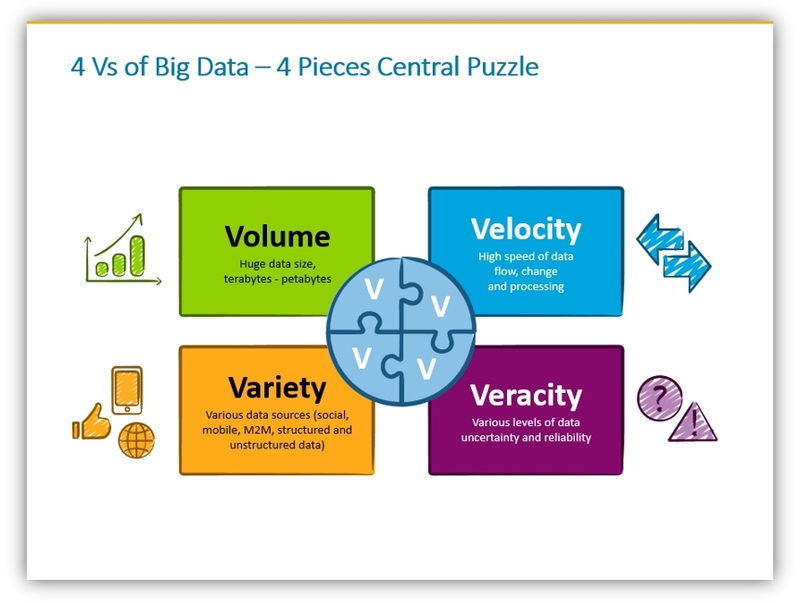 Also in the case of Big Data, you can start with an eye-catching definition. 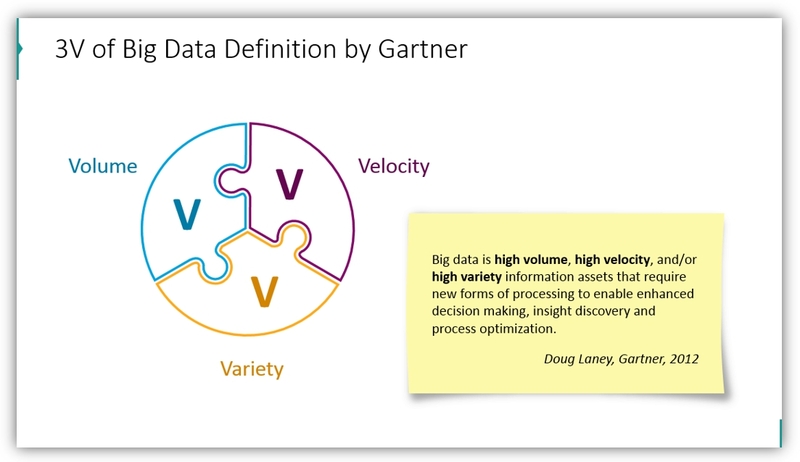 Here we present a Big Data definition slide with a quote by Doug Laney from Gartner. Adding a quote adds credibility to your presentation. To make slide more visual, you can add a simple illustration of the citation content or at least put words on some graphical background (for more examples of visualizing famous quotes see this blog). 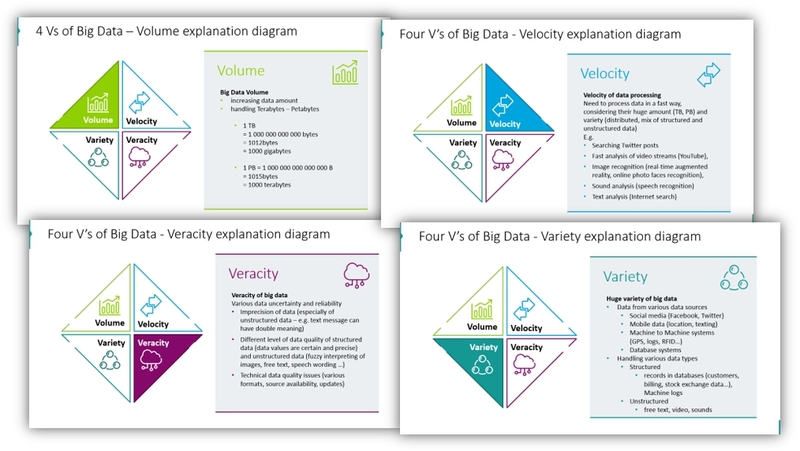 Following the Big Data definition, we can develop further the concept of 3 or 4V’s. As they are creating a complete whole, let’s represent them by a compact diagram – a puzzle shape is ideal for that. Or if you don’t like jigsaw puzzle look, use more simple segmented diamond shape. 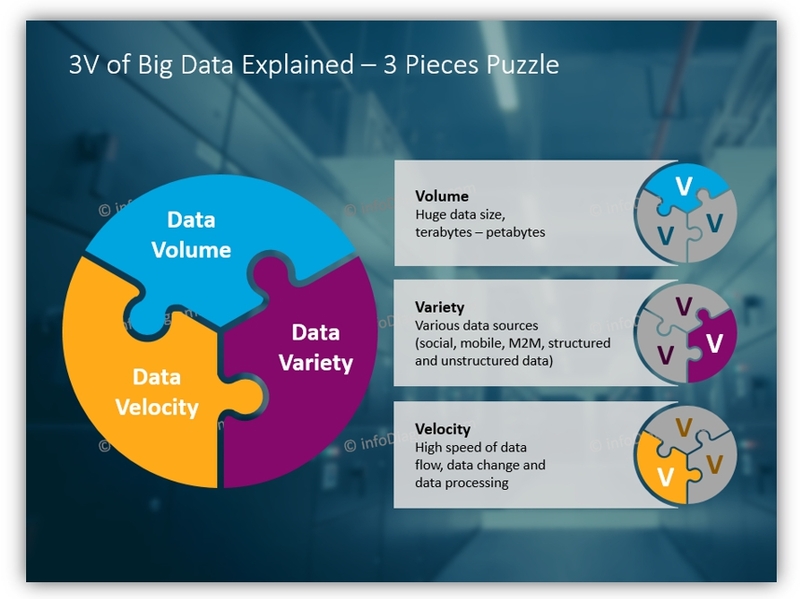 Big Data Volume item – the ever-increasing amount of data, leading to huge information volumes that need to be handled by data infrastructure and tool. Variety of data structures – besides classical organized data formats (databases, forms…) more and more data come in the unstructured form of free text, social media messages. The challenge is how to extract meaningful information out of them. 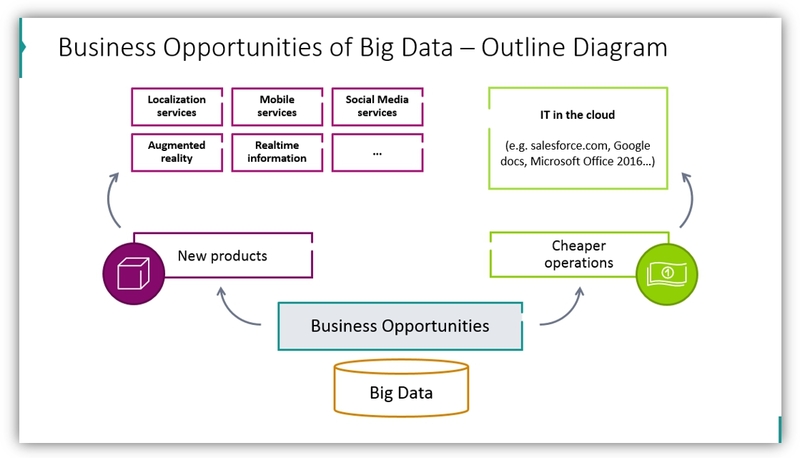 Another topic you can present visually are relations among concepts such as “Cloud Applications”, “Software as a Service” and Big Data. If you want to show another type of relation between those areas, move diagram elements around, redirect arrows to indicate your viewpoint. healthcare and medical research – all those personal smart wearables are using cloud data. Research also benefits from computational power offered by distributed computing. 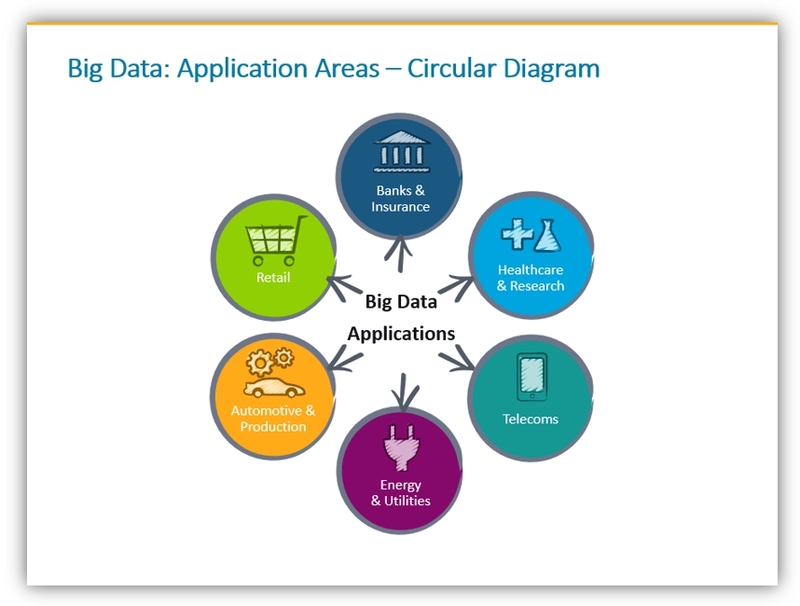 retail also take advantage of big data technologies on a big scale. Role example is how Amazon leverages the possibilities of the cloud. Amazon actually evolved from e-commerce to one of the biggest data technology providers by offering AWS. Then you can expand on each area. Here’s how you can show new products that can thrive thanks to those new technologies. We mention localization services, emerging new mobile and social media apps, for example, but feel free to adapt the list to your case. 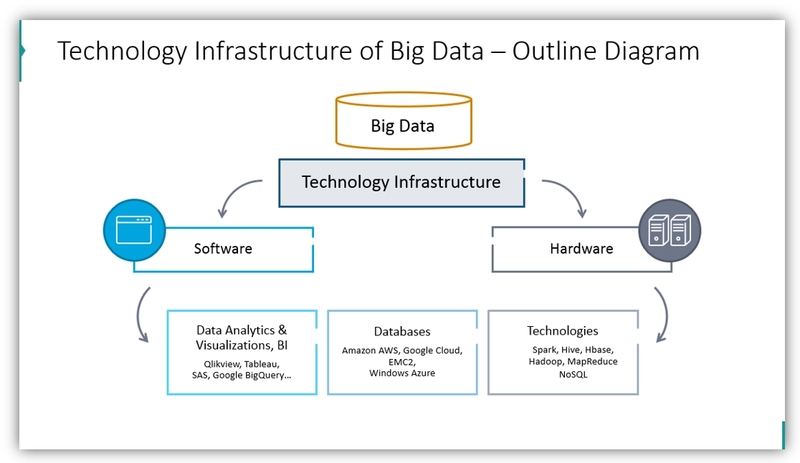 Big data needs a technical infrastructure to run on, including various software tools that allow to store and extract the information we need. 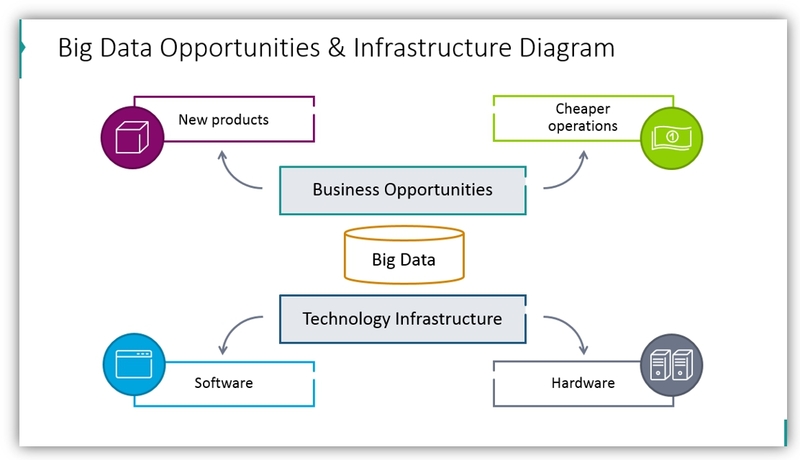 I would add here Data Analytics & Visualization solutions, data storing technologies such as Hadoop, MapReduce, NoSQL. And of course robust hardware – computer data centers, networks distributed globally and able to send all that data across the world. 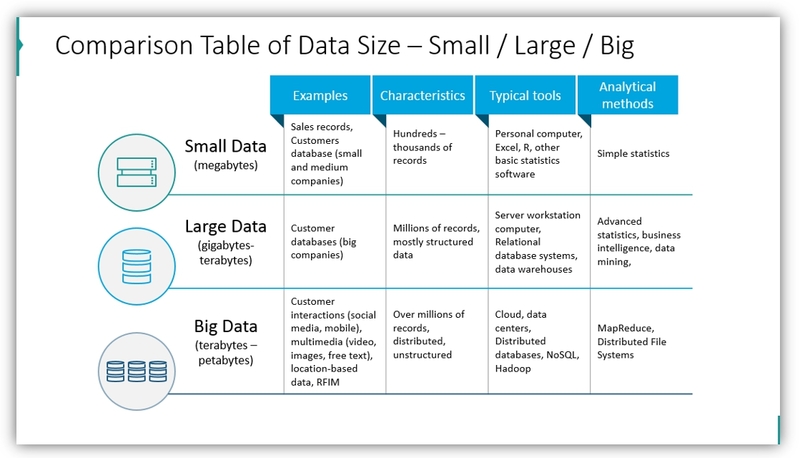 Let’s make people aware of data volumes – what is small, large and what is big data? Give examples and compare them side by side in a single table. Check this article for more creative designs to visualize a PowerPoint table. It’s worth to spend a few minutes more on presentation to add there visuals that will underline your message. Using vivid visuals help to keep your audience engaged and expanding their attention span. It does not need to be a fancy complex infographics. As you could see, a simple concept diagram will do, too. I hope those examples inspired you. You can try to recreate them by our own, or make use of our slide-deck template mentioned below. To save you time developing such visuals we designed an editable PowerPoint template with various IT diagrams, flowcharts and icons. 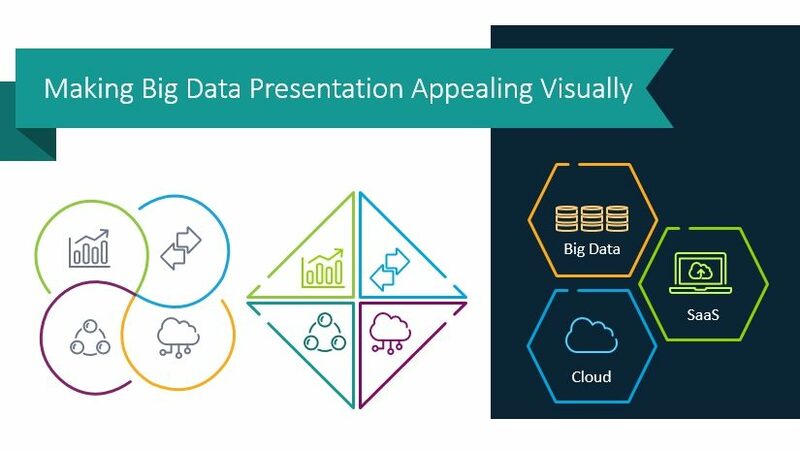 Use these PPT graphics to prepare professional and modern Big Data tutorials and training materials. GO and create engaging infographics. 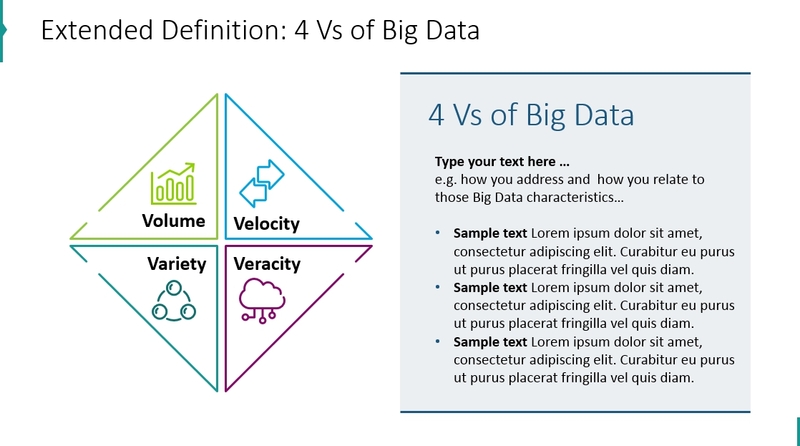 In case you prefer less formal sketchy style, check Creative Big Data PowerPoint Visuals here. The IT icon set can be extended by wider Flat Icons Library with over 380 visual symbols.